Buy Online Now! 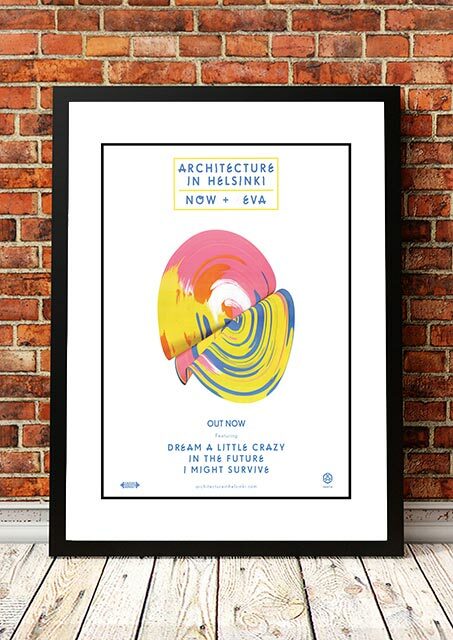 – Architecture in Helsinki Rock Concert Posters and Memorabilia. Architecture in Helsinki is an Australian indie pop band that has released five studio albums: Fingers Crossed (2003), In Case We Die (2005), Places Like this (2007), Moment Bends (2011), and Now + 4EVA (2014). Lead Singer Cameron Bird got the band’s name after cutting up a newspaper and re-arranging words. We stock an awesome Architecture in Helsinki Poster from 2014. Available in different sizes and printed on high quality 210gsm paper, you’ll find no unsightly pin holes, stains or creases. In fact, it looks like it could have come straight off the press from the original print run. Will look fantastic framed on your man cave, office, bar or living room wall.